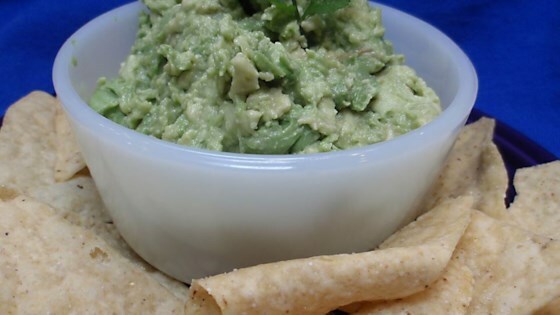 "This is certainly one of the easiest guacamole recipes I have ever encountered. As a guacamole connoisseur, I was highly skeptical. After learning that one of the more famous Mexican restaurants in northern New Mexico uses a similar recipe, I decided to give it a try. The taste was amazing!" Stir together avocado and garlic salt until smooth and evenly combined. To keep guacamole from turning brown, leave one of the avocado pits in until ready to serve. A chunky-style guacamole with diced jalapenos, garlic, and tomatoes. Might be authentic, but my family missed the other ingredients we usually add. I was a little skeptical b/c it was so simple, but it was so, so good! I used a bit of minced garlic and coarse kosher salt. Yummy! I'm a little sheepish that this is all it takes. A little lime adds flavor; minced tomato, color; minced onion, crunch. Guacamole solved!